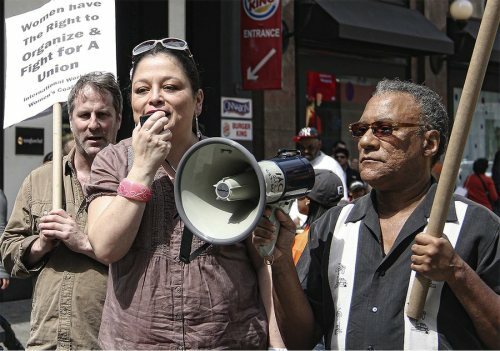 More than 200 activists, including many low-wage workers, marched on March 15 throughout the Herald Square area of New York City to demand a minimum wage of $15 an hour for all workers and the right to a union. Chanting “The workers united will never be defeated,” marchers stopped in front of major low-wage employers like Foot Locker, H&M clothing store and McDonald’s, and sent delegations into the stores to show solidarity with the workers. 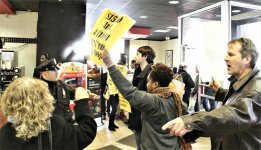 Workers at McDonald’s smiled as a group of about 10 marchers entered their restaurant with signs reading, “Every worker has a right to a union.” The marchers wished the workers well in their fight for $15 an hour and a union before being escorted out by the police. The Herald Square area is one of the biggest and busiest shopping areas in NYC, as well as an area where hundreds of thousands of workers making under $9 an hour. The march, called “March for $15 on March 15,” was organized by the Peoples Power Assembly and the Occupy Wall Street movement. Similar marches organized by the Fight for $15 Campaign took place in about 20 other cities. 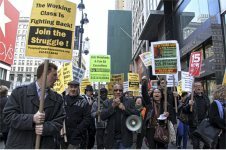 The People’s Power Assembly Movement, along with allies like OccuEvolve, took to the streets of New York City with signs and banners on April 12 for a speak-out in the busy midtown shopping area of Herald Square. There, the protesters displayed solidarity with the mushrooming national campaign of workers seeking a $15-an-hour minimum wage and the right to organize. Passersby stopped to listen to the activists and took literature. Some of the PPA activists did a flash mob inside a nearby McDonald’s for a considerable amount of time before being escorted out by the police.